Kai Conut Villa is directly sound-front in Cayman Kai, within Rum Point on the north coast. 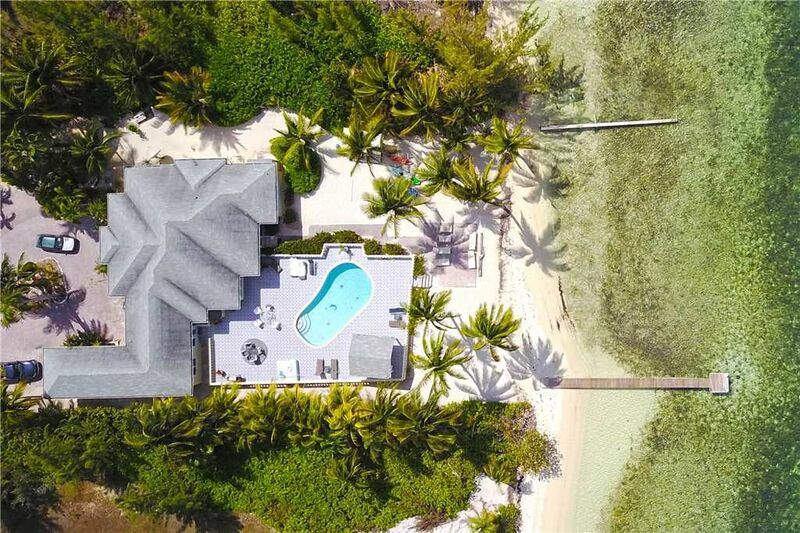 A one-story, private villa with a barefoot swimming beach shaded by palms and Casuarina pines, Kai Conut is perfect for families with small children. Kai Conut’s spacious, fully modern living, brand new kitchen and dining areas are separated from the outdoors by walls of windows and sliding glass doors, so the home is filled with sunlight at any time of year. Whether you’re enjoying breakfast at the dining table or reclining on the sectional sofa, you can always enjoy the natural beauty that Kai Conut has to offer. Panoramic views to the northwest offer not only the azure waters off of Cayman Kai but the boats visiting Stingray Sandbar. Sitting at the end of Water Cay Road, guests won’t see anyone else for their entire stay if they don’t care to. — Large, oceanfront freshwater pool with a shady cabana offering table and chairs for reading, lounging or having lunch while the kids play in the pool or swim in the ocean. Accommodates up to 12 people, 10 adults max. Excellent large family villa as well as a 3-4 couple's villa. Twins can be made up as a king bed upon request. Two kayaks & stand-up-paddleboards provided! (waiver required). Additional kayaks and paddleboards available for rental. Panoramic views to the northwest offer not only the azure waters off of Cayman Kai but the boats visiting Stingray Sandbar. Sitting at the end of Water Cay Road, guests won’t see anyone else for their entire stay if they don’t care to. We rented Kai Conut for a big family trip on my husbands 70 bday. We had a great trip and the house, pool and beach were so wonderful! Plenty of space for all 7 of us to spread out and sleep well. Would do again for sure! The property is well-cared for and the kitchen is very well-equipped. We spent most of our time on the huge patio with all of the tables, chairs and lounge chairs. The pool is perfect and the children loved it. Having our own private beach was fun, and the kids found lots of conch, a sting ray and other sea creatures. Everyone enjoyed the kayaks and paddle boards. The only reason for 4 stars instead of 5 is the distance from the airport, grocery shopping and restaurants. Although there are a few nearby, we missed our favorites on Seven Mile Beach. I recommend the Rum Point Club for a nice evening out. The food was wonderful. However, if you are looking for a nice quiet place to vacation, Kai Conut can't be beat! We are happy you enjoyed your stay at Kai Conut. Tough to knock the house because of the location. 99.9% of the people who rent in Cayman Kai and Rum Point do so to get AWAY from the crowds, traffic and cruise ship people. There are wonderful restaurants in the area and several more across the top of the island. Starfish Point is a short beach walk away as well - nothing like that anywhere else on the island! Kaicoconut was a fantastic experience from the moment we entered the villa. Although it was just my husband and I, the house was big enough for our daughter and grandkids to all have their own rooms if they had not had school. Unbelievable views from the house, outside area was very large with plenty of options for outdoor activities. Would have been a perfect 5 star rating if the fans on the patio had worked and we didn’t have a a/c leak in the front bathroom ceiling. We took advantage of all the great restaurants on the east end, especially The Lighthouse. Thank you for sharing your lovely home with us. The property was located at the secluded end of a private street right next door to Starfish Point. It was perfect for our family of 10 ranging in age from 6 months to those in their 60s - the pool was great as well as the beach. There were kayaks and standup boards as well as pool toys for the kids. Very well equipped kitchen and altogether a very comfortable layout. We would recommend it highly. Overall, a good experience and a nice place to stay. You couldn't ask for a better location as it is literally on Star Fish Point with the primary access to Star Fish Point just across the street. Kaibo Marina is an easy walk down the street for drinks or lunch. The house fronts the sound so you have a great view of the water and can even see all of the action of Sting Ray City off in the distance. The pool is a nice bonus for relaxing, especially at night. The house is fairly well equipped and the overall condition and experience was good. We did have a problem with the ice maker not making any ice for the first day. A call to Silver Thatch brought a delivery of ice in bags to compensate. Everything else worked great. Fantastic washer and dryer, AC cooled the house very well, etc. There were a couple of negative surprises. First, one of the bedrooms that opens to the living room has two openings in the top of the door. Not even glass; literally the top two panels of the six panel door are cut out for some reason. This means that whoever is sleeping in that room has all of the noise and light from the living room coming into their room. And they have no real privacy. This was not a good experience for the couple sleeping in this room. I can't imagine why this door was cut this way, but it could be an easy fix for the owner: just replace the door with a solid door. Another minor disappointment is that the closet in the master suite is locked. This means that there is no closet for use of the renter which meant we had to have our suitcases and clothes out in the bedroom (although there was plenty of drawer space for folded clothes). I would rather see the owner set aside a locked closet in the laundry room, etc, for their owner's closet and allow the renter to have the bedroom closet to hang clothes, store suitcases, etc. In fact, only two of the five bedrooms had closets available to the renter. Overall, the house was a good experience, and we enjoyed our stay very much. I would stay there again if they replace the one bedroom door mentioned above. Silver Thatch is a great company to work with and is very responsive to needs. Thank you for your review. Wish you had said something about the door when you were there. Door will be replaced next week. Please come back again soon! Great home and like you said, great location. Wonderful home to stay at, the last home on the north side past Rum Point. The home was great and more than enough room for two families of four. It was very clean and neat the pool our kids lived in for the week. We didn't cook much at home but full kitchen for appetizers and drinks to have at the pool and beach. We spent several hours in the ocean and did go see the Sting Rays. we went out of Rum Point through Red Sail Tours as there was a total of 12 people on the Catamaran going to the Sting Rays so we spent a lot of one on one with them and the crew! Judy and her husband are the people who care for the house and they came buy often to see if we needed anything very wonderful people and quite helpful. I would definitely return to the Cayman Islands and this home! The entire island is only 22 miles wide from west to east, so you are never too far from anywhere on Grand Cayman. The sunsets here are wonderful, but the big draw to this area is the proximity to the Rum Point Club, a public beach club that offers a fantastic barefoot beach, watersports, a restaurant bar and grill, a gift shop and pick-up beach volleyball games. Also nearby is the Kaibo Yacht Club restaurant, bar and marina. The homes on the sound front in Cayman Kai offer the best beaches as they don’t have as much marine and plant life trying to make a home in the shallows. The beaches here are typically soft white sand. The homes facing west offer barefoot swimming in shallow calm water. The homes facing south (Kai Rumba, Pools of the Kai, Kai Sound Studio) have great white sand beaches with softer sea bottom. You will probably want to walk across the street to swim in sandier water.